Hey guys! Hope your week is going well! Today’s recipe is another one of those “it’s use the produce or lose it” kind of recipes. Two bell peppers had been hanging out in my fridge for a few days, and I had to find a way to use up two peppers all at once. Trader Joe’s only sells their organic bell peppers in packages of two. It really does bug me that you can buy their conventional ones individually, but not the organic. My potatoes were also starting to sprout, so whatever I made, it needed to use up some potatoes. I did some searching online to find a recipe that would require both. I didn’t really want to mess with roasting the peppers, so it also needed to be something that didn’t require that. I came across a recipe on the New York Times website that sounded good. I made a few changes to their recipe, and I loved how it turned out. The smoked paprika adds a bit of smokey flavor, and the cayenne gives a nice kick to the soup. Totally delish! In the NY Times recipe, they poured the soup through a strainer before adding it back to the pot to heat through. I personally skipped this step (actually, I totally forgot), but I didn’t mind the tiny bits of pepper. I used an immersion blender, so it would’ve required dirtying the strainer and another dish. Yep, I can deal with a few tiny bits of pepper to avoid extra dirty dishes. 🙂 If you want the soup to be totally smooth, you can use a strainer. Totally up to you. 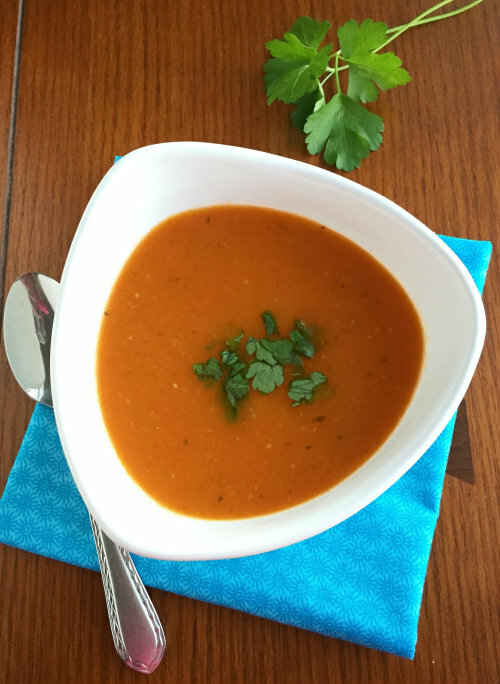 This Smokey Red Pepper and Potato Soup makes a great starter soup, but would also make a great side dish to a grilled cheese sandwich. Heat 1 tablespoon of oil in a large soup pot over medium heat. Add the onions, carrots and celery to the pot and let cook, stirring occasionally, until the veggies begin to soften. Add 1/2 tsp of sea salt and continue to cook, stirring occasionally until tender, about 5 minutes. Stir in the tomato paste, 2 tsp of smoked paprika and garlic and let cook for about a minute. Add the peppers and another 1/2 tsp of salt and let cook, stirring occasionally, until peppers start to soften, about 5 minutes. Add in the chicken stock, potatoes and fresh parsley and bring to a simmer. Cover and simmer over low heat for about 20 minutes. Puree the soup until smooth using either an immersion blender, regular blender or food processor. If using a blender or food processor, you may need to work in batches. Be careful when blending hot liquids. Heat through again and check seasonings prior to serving. Garnish with extra parsley. 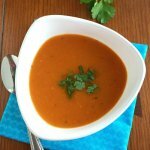 If you want the soup to be completely smooth in consistency, you can pour it through a strainer.